Color a bit off, the green from the parsley is visible and the salmon color is more bright. I made this dish a long time ago, so it seems, about a year ago. My son loved it. So funny that this days Quinoa is so easy to make the kids like it. In my times the only quinoa I like was the sweet quinoa that my mom or dad made once in a while. 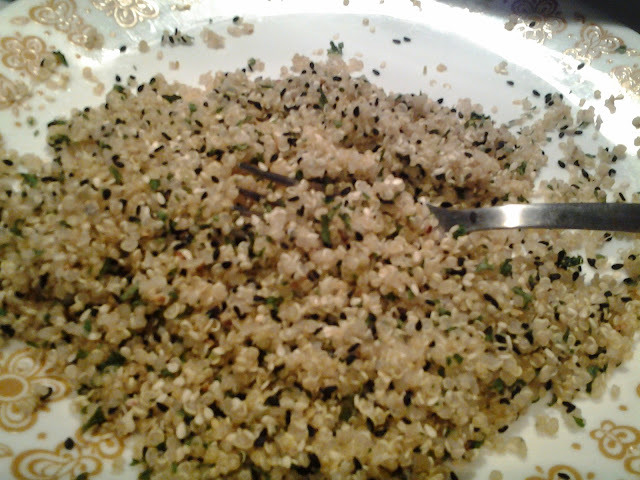 Those days Quinoa was underestimated by many, it was mostly found in the tables of low income families, mine been one. I knew someone that even fed quinoa to the hens and chickens. Funny, now is us that look for this high quality grain/seed and we now pay a high price for it. Now in Peru, Quinoa is part of the Culinary Boom and if you want to eat it, well you have to pay the high prices as well. Sad. A serving suggestion, make an Arugula salad with halfed cherry tomatoes and lightly dressed with lime, oil and salt. 1.The first thing to do, is to get the "mise en place" (gather ingredients and make the small preparations to organize what you need for your recipe) for each part of the recipe. Fillets arrange on a cutting board. A bowl with the Corn Starch, lightly season the corn starch with a pinch or two of salt. A bowl with the egg, also lightly season with salt. 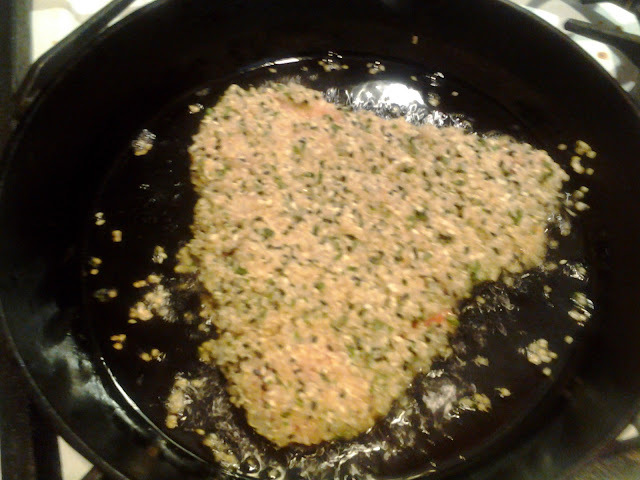 Here is the Quinoa Mixture, color are more bright, but my camera was playing tricks on me this day. On the third bowl combine the quinoa (follow how to cook quinoa, and make sure to use it after is cold and completely drain from water; leave the quinoa on a strainer inside the refrigerator, do not cover, this will help the quinoa to be dried),sesame seeds, parsley and season with the Kosher Salt; you can actually taste this mix and season with maybe some pepper if you wish. For me parsley and Salt was enough. 2. After all your mise en place is ready, follow procedure for breading, in this procedure the corn starch will replace the flour, and the quinoa mixture will replace the panko or bread crumb mixture. 3. When all the fish had been "breaded", place on the sheet-pan and take it to the freezer for 30 minutes. 5. 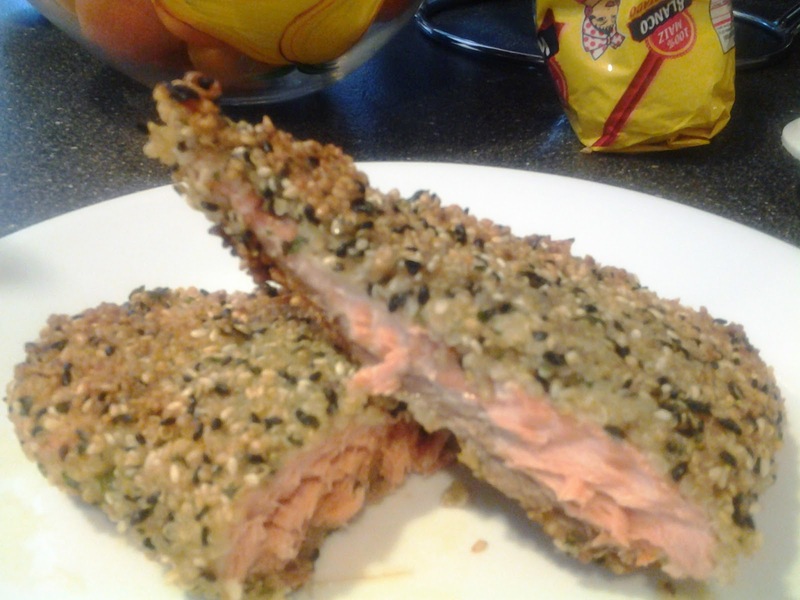 Salmon cooks relatively fast, make sure your crust is golden all around it might take a total of 4 minutes; and with A-hi Tuna is even easier because is nice to see the Tuna not all the way cook, the perfect Tuna is eaten medium rare. This was my last piece, it was to big. Look for smaller fillets, It will make it easy on you at the time of frying.